'Okaeri' explores intersections of LGBTQ, Nikkei communities. From left: Panelists Marie Morohoshi and Mia Yamamoto with moderator Gary Hayashi. 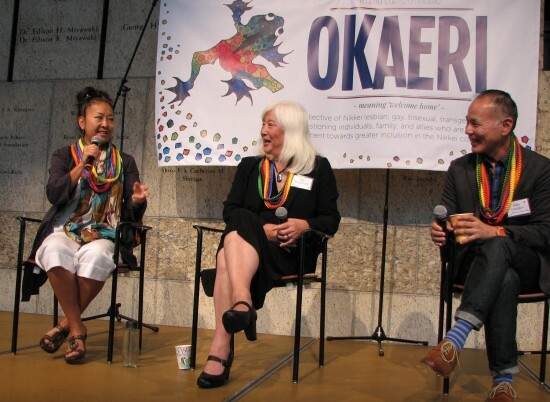 Members of the lesbian, gay, bisexual, transgender, queer/questioning community and their allies shared their stories at “Okaeri,” a Nikkei LGBTQ gathering held Nov. 15 at the Japanese American National Museum in Little Tokyo. During the lunchtime plenary session, a panel of activists talked about their personal experiences as well as their thoughts on where the Nikkei and LGBTQ communities need to go from here. Moderator Gary Hayashi, who has a private practice as a licensed marriage and family therapist in South Pasadena, was raised in Los Angeles by Nisei parents. “I grew up in the church,” he said. “I always kind of heard the message that God didn’t like gay people, so when I became a gay people … I was so freaked out about it that I kept it secret for a very long time. “Then I went into an ‘ex-gay’ ministry to try to change this thing that I thought was changeable at that time. After seven years, I realized this whole thing was bogus and didn’t work, and I came out at the ripe old age of 42 and looked around and didn’t see many guys like me. 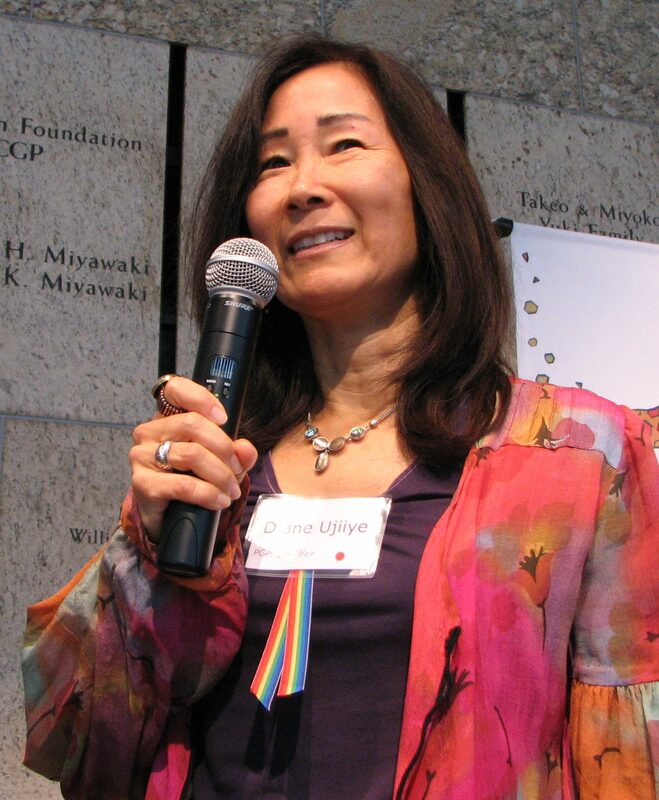 Mia Yamamoto, a criminal defense lawyer, was born in the Poston, Ariz. internment camp, served in Vietnam, and founded the UCLA Law School Asian Pacific Islander Law Students Association. Her father was a lawyer in the 1930s and ’40s and had an office in the San Pedro Firm Building in Little Tokyo. Rev. 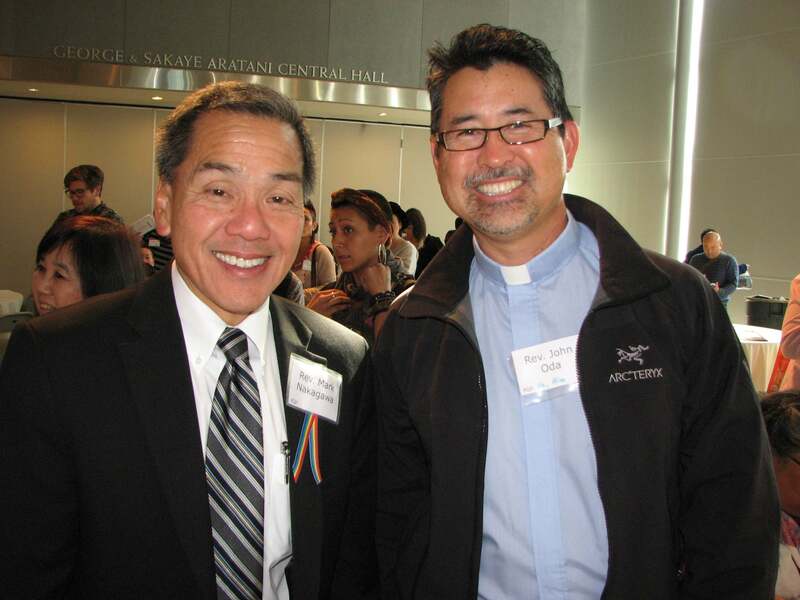 Mark Nakagawa (left) of Centenary UMC facilitated a workshop on “Religious Advocates of LGBTQ Persons and Families” with speakers Rev. 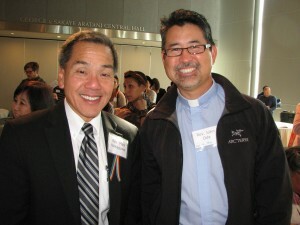 John Oda (right) of Lake Park UMC in Oakland and Rinban William Briones of Nishi Hongwanji. Diane Ujiiye co-facilitated a workshop on “Holding on to My Faith” and the closing program. Although there were “a few haters,” she was pleasantly surprised by the reaction from her colleagues. “Judges would come down off the bench in their black robes to give me a hug and kiss and congratulate me. I was blown away. I had expected so much ridicule and rejection … I was moved to tears at how little I had expected of my peers. They were incredible. Even the Republicans. Yamamoto remains on good terms with members of her brother’s family and even plays in a band with his three sons. Marie Kyoko Morohoshi, who has a reiki/healing arts practice in the Bay Area, was raised in Torrance and Gardena by a mother from Japan and a Kibei Nisei father who was a “no-no boy” at Tule Lake. She attended Japanese school, where her mother was a teacher, and studied subjects like tea ceremony and ikebana. Sansei and Yonsei kids labeled her “FOB” (fresh off the boat) because she spoke Japanese, even though her English was flawless. 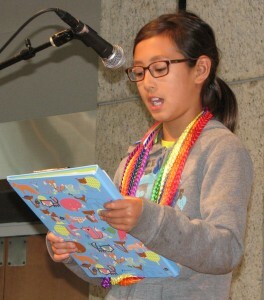 Fourth-grader Maiya Grace Kuida-Osumi read two of her stories. On coming out to the community, she said, “We are not one unit floating in the universe by ourselves, we are attached to these family members who have a name and a reputation. That’s huge in Asian culture … Acting as a solo agent, I think I would have been fine being out in the world, but because my mom had a pivotal role in the community, I definitely didn’t come out then [during the ’80s]. At Long Beach State, Morohoshi urged the women’s studies program to be more inclusive of people of color, and called out ethnic studies and Asian American studies classes for their “heterosexist” language. “I was doing all this work to validate a sense of myself, so I just made my own space,” she recalled. She rented a space in the Women’s Resource Center and started an Asian American women’s discussion group using curriculum from “radical Asian lesbian feminists” in the Bay Area. Many of the women who attended came out. “That wasn’t my intention … It ended up being a safe haven for people …. For those interested in becoming LGBTQ activists, Morohoshi recommended starting from the field one is working in. As a staff member of the National Asian American Telecommunications Association (now the Center for Asian American Media) and a curator for the San Francisco International Asian American Film Festival (now CAAMfest), “I wanted to put more lesbians on the screen … I decided, well, I know there are some filmmakers … I programmed a lot of Asian American lesbian stuff, and the closing night was a lesbian film.” She also included works with transgender themes. Whether you are a parent, a teacher or an IT specialist, “just step it up wherever you are in your life,” she said. 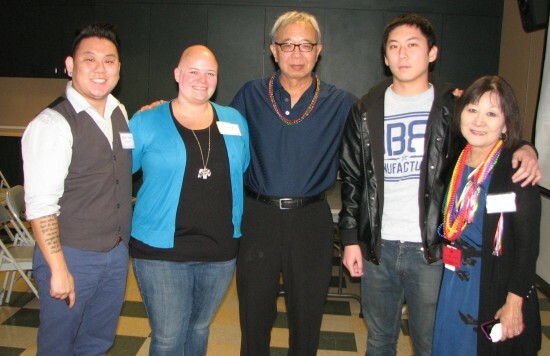 From left: Aiden Takeo Aizumi with wife Mary, father Tad, brother Stefen and mother Marsha.